This book couldn't have come into my hands at a better time. Many of the passages felt like the author had visited me, knew my creative dilemmas and wrote those responses exclusively for me. As I was reading "Big Magic", I could feel nodding my head vigorously at multiple places. The author talks about our creative genius, the process of feeling inspired, the fear and excuses that hold us back and most importantly, falling in love with the process and keeping the outcome aside. Bhagavat Gita has conveyed the same principle but it has to be retold again and again, given the pressure that we (and our society) place on outcome. Elizabeth's personal anecdotes and her easy-to-read flow of writing make this very interesting non-fiction book a page turner. Perhaps, call it the self-help book on creativity. She starts off brilliantly by posing a thought-provoking question. "Do you have the courage to bring forth the treasures that are hidden within you?" The process of uncovering these treasures is what she refers to as "creative living". She quickly clarifies that it's not just about arts but any activity that elevates us, that makes us feel alive. Many of us feel scared to go down this path, as we doubt ourselves and fear that we don't have talent, resources, time, blah-blah….Fear actually makes our lives boring and she suggests that we acknowledge the presence of fear but not be driven by it. Once we give the rightful place to our fears, inspiration finds a way towards us. I just loved the way how she describes an idea as a living entity in the cosmos and it's sole purpose is to get manifested by the right human being. Many times, we get inspired or drawn towards certain ideas and they keep coming back to us at many different places in our life, trying to grab our attention. It's all about how much we are ready to pay attention towards these interventions. "Be ready. Keep your eyes open. Listen. Follow your curiosity. Ask questions. Sniff around. Remain open. Trust in the miraculous truth that new and marvelous ideas are looking for human collaborators every single day…." She hits the nail on the head when she argues about why creativity is for all and not for the selected exclusive few. "If you're alive, you're a creative person". Period. Her sincere advice to those who have found their creative calling is to be persistent and disciplined and enjoy the work you're drawn to, without worrying about the outcomes. There will be times when you are frustrated but frustration is not an outcome but it's part of the creative process itself. Do you burden your creativity with paying your bills? She suggests not to and I agree with her reasons. The other issue that prevents us from staying in the game is the fantasy of perfection. Done is better than good. Enjoy the smallest progress, Be actively creating something. 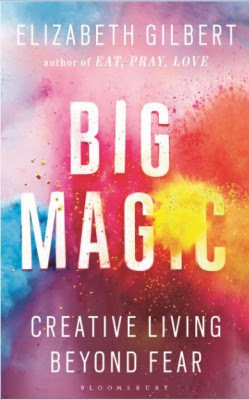 "Big Magic" is filled with these little nuggets of inspiration, the common myths that engulf the creative process and actionable insights towards a creative, fulfilling life. I wish she had also talked about a few examples of creative process in the corporate world across various domains. It would have helped me to tie together these different ideas on creativity, given my background. Relevant and hard-hitting, I highly recommend "Big Magic" to anyone who is curious about creativity.